Deity yoga is a fundamental aspect of Vajrayana Buddhism. 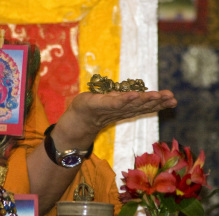 To practice deity yoga, students first receive an empowerment or initiation from a lama. The empowerment grants you permission to practice a specific deity and gives you access to the benefits associated with that practice. In an empowerment ceremony, an authentic accomplished lama leads a ritual that includes a description, explanation, and visualization of the practice. The empowerment may be long or short, depending on the deity, and students receive the oral lineage transmission that bestows the practice blessing and energy. During an empowerment ritual, students should generate a relaxed, peaceful, and loving mind and try to be alert and aware of what is happening. The lama will give precise details about how to do the practice at the time of the initiation, and it is ok and helpful to take notes of the descriptions and visualizations. After an empowerment ceremony, a lama may give a commentary on the practice or a retreat may be organized to help you learn the practice. Also, books may be available that detail how to do the practice. To get a better understanding of how an empowerment works it is helpful to learn about Buddha nature. "The pure aspect of living beings is the Buddha nature, which is the clear and lucid power of awareness that everyone has." (Ven. Khenchen Thrangu Rinpoche). This is the true nature of our mind, present since beginningless time. Because of this essential nature, we all have within us the potential to awaken into Buddhahood. The empowerment process draws that potential out so it can express itself more fully. When you receive an empowerment, it is the true nature of your mind—your Buddha nature—that provides the basis to accelerate your spiritual ripening. Once these auspicious imprints are established in your mindstream and you begin to mindfully practice the deity, you create the conditions for the empowerment to awaken within you a state of wisdom where space and awareness are inseparable. This is, and has always been, your Buddha nature. Although many deity yoga practices require an empowerment to engage in practice, quite a few do not. At RigDzin Dharma Center, we regularly practice White Tara, Medicine Buddha, Amitabha, Lama Chopa, Milarepa and Achi Chokyi Drolma, all of which do not require an empowerment to participate. However, students are encouraged to take an empowerment when the opportunity arises, as it will deepen your practice and strengthen your connection to the deity. To learn more about the deities and deity yoga practice visit our "Deity Yoga" page.